Sara and I realized our interest in birding just three scant years ago, and what a time it’s been. We have, as regular readers of this blog know, learned a lot in that time. However, this spring is the first in which I feel attuned to the rhythms of returning birds. The knowledge of which species to look out for week by week makes the slow trickle of new arrivals this early in the season so much more satisfying. Last weekend, the stars for us were Eastern Phoebe and Carolina Wren; this weekend, new species took center stage. The Core Team met up with our good friends Frank and Shonna and their delightful daughter, Lulu for a trip to Marshlands Conservancy in Rye, NY. Mason just loves Lulu, so the combination of great company, great weather, and great habitat proved the perfect recipe for a stellar Sunday morning. Marshlands is a superb slice of mixed ecosystems on the eastern shores of Westchester County. Sara and I spotted our first Great Horned Owl here, but hadn’t returned since. We’ve been missing a lot — woods, meadows, and the rocky shores of the Long Island Sound. One thing I did remember, one fact about this place that a person can count on, is the up-close-and-personal presence of Wild Turkeys. The rough and wonderful Visitor’s Center has an amazing feeder array that seems to have the local turkeys transfixed. They voraciously mill about in front of the large plate glass viewing window, often fighting over the right to roost right in front of dazzled spectators. Our first turkey sighting of the year was a brilliant tom, resplendent in his angry pink caruncles and iridescent bronze plumage. While his compatriots lurked in the woods, he wisely fortified himself for the challenges of the coming season. Take my advice: if you absolutely need to see a Wild Turkey in the area of NYC, you’ll find no better or surer spot than Marshlands Conservancy. This magical feeder attracted other, much smaller species from chickadees and titmice to goldfinches and cardinals. We also saw the expected cardinals, jays, and crows, but of course, we were looking for more than the usual species, something a bit more glamorous than White-throated Sparrows and Turkey Vultures. The lack of ducks on the sound didn’t bother us, considering that the season for waterfowl is on the wane. It’s all about passerines from here on out and the flavor of the week is Tree Swallows! Ambitious migrants have already claimed the best swallow boxes throughout the Tri-state area. 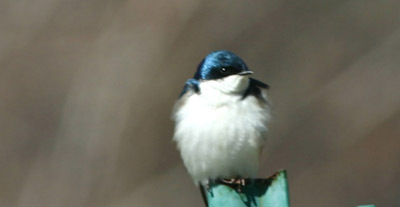 Now, before other birds arrive, is a particularly good time to look at Tree Swallows. They are often overlooked despite their lazy azure elegance, which is a real shame. Usually birds this blue and this beautiful command more attention. We are, with the rest of the area’s birders, on the lookout for the first Pine Warblers of spring. I did spot a likely suspect but couldn’t get a fix on it; if you learn anything from my experience, take away the painful truth that binoculars just don’t function to optimal effect when deployed with one hand while the other cradles a squirmy two-year old! The bird, flashing black and white wings, could have been a warbler, a vireo, even a flycatcher. What matters is that these are even possibilities. Spring is here!